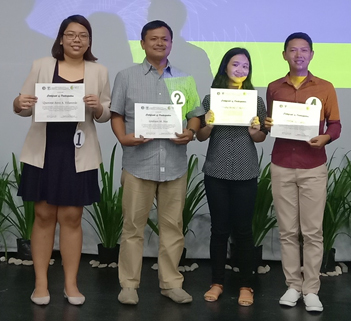 Trisha Anne O. Betito, a Political Science student, was selected as the winner by both the judges and the audience in the recently concluded Three-Minute Thesis Competition on 1 February 2019 at the Fr. Alingal Convention Hall. Betito bested other contestants representing different fields: Quennie Anne Villaverde (Psychology), Graham Naz (Social Studies – Education; Runner-up) and Christian Canaco (Mathematics – Education). The Three-Minute Thesis (3MT) Competition, with permission from the University of Queensland, Australia, is held annually at the Ateneo de Naga University to cap the Research and Creative Endeavors Colloquium organized by the University Research Council (URC). In this event, students who have completed collecting data for their thesis present the most significant findings of their research in no more than three minutes. The URC believes that holding the annual 3MT helps in the fostering of a vibrant research culture in the University. 3MT contestants from the left: Quennie Anne Villaverde, Graham Naz, Trisha Anne Betito and Christian Canaco.